I've finally done all of them myself! Got the idea from Gypsie, but he/she didn't do them all, so I made mine from scratch. Sets, Venues, Worlds and even a pack of Limited Item Sets are here. In total 223 folders... phew. 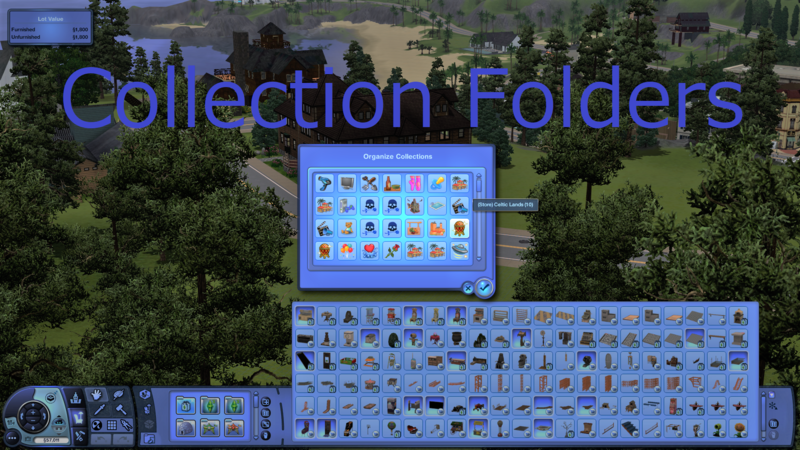 Collection Folders for The Sims 3 Store Decrapyfied Item Sets. Will not work for the original store files. I recommend using them alongside "Collection Icons and Files" mod by heaven. They aren't actual items, just folders they go into. You need to have the items in your game already for the folders to fill with them. Into C:\Documents\Electronic Arts\The Sims 3\Collections\User . Not your mods folder! Also take them out of the folders they are in. Only copy bare .packages files to User. What are these letters and numbers in folder names? Where "(Store)" is pretty obvious, meaning Store Set. "(x)" in place of "x" is "V" for Venue (Lot) and "W" for World (Neighborhood). "(y+z)" where "y" is a number of Buy/Build items in a folder, "z" is a number of Buy/Build items that couldn't be placed in a folder, at least to my knowledge (like few mailboxes and bridges). Finally "c" is a number of CAS items, or in a few Worlds cases Venues in that set, which cannot be placed inside a folder. As a point of reference I used mainly official The Sims 3 Store item listings. Order of items in folders is the same as listed on Store pages. For that reason not only item order is a bit odd, but also most probably there are some items missing. I tried my best to not miss anything, but I just don't know what these sets contain. If you notice any item missing from Collection Folder feel free to let me know, I'll add it in. Big thanks to Gypsy for the idea and to heaven for amazing folder icons. (Store) All Store Collection Folder Files v1.0.rar | Description: 223 Collection Folders files. 3. Install: Cut and paste the .package files you want into your C:\Documents\Electronic Arts\The Sims 3\Collections\User folder. You can pick whichever you want to use. They are all independent. 4. Run the game, and in Buy or Build mode click collections icon to browse new folders. 1. Just delete the file you don't want from C:\Documents\Electronic Arts\The Sims 3\Collections\User folder.